I miss Motorola. It's been a while since they've introduced a good handset in Europe. Well, that's about to change with Motorola's recent introduction of the Motorola DEXT also known as the Motorola CLIQ in the US. 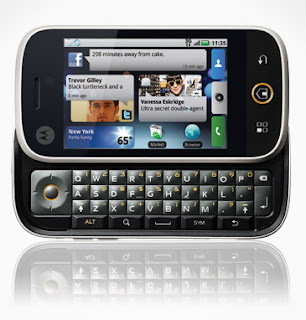 While most Android powered devices nowadays are full touchscreen mobile phones like the Samsung Galaxy, Vodafone Magic, and the HTC Hero, the Motorola DEXT not only has a 3.1 inch capacitive touchscreen, it also has a slide-out QWERTY keyboard which puts Motorola's baby head to head with the HTC Dream. The Motorola DEXT also sports a 3.5mm headset jack. The Motorola DEXT runs Android 1.5, has 528MHz processor, 256MB RAM, 1GB storage capacity expandable via MicroSD slot, accelerometer, WiFi, GPS, 3G/HSDPA, and a 5 megapixel camera. Truly the Motorola DEXT is a high-end device, set to compete with the likes of the iPhone, Palm Pre, and the pletora of Google phones out today. 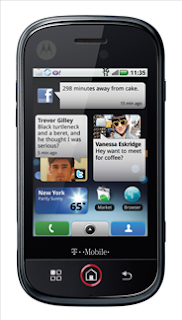 If the HTC Hero has a custom UI, so does the Motorola DEXT. Motorola boasts of the MotoBLUR homescreen which allows you to sync your contacts with almost all of the social networking sites out there: Twitter, Facebook, Gmail, Myspace, etc. You can actually update your status in all of these social networking sites with just one post without you manually going through each and every one of these sites. It's pretty cool if you're a social networking addict. The 5 megapixel camera has autofocus and is capable of HVGA videos at 23fps. As for the performance of the UI, the demo video below seems to indicate that the UI is fast and responsive, definitely comparable with the iPhone's UI. I truly welcome the addition of the Motorola DEXT in Motorola's portfolio. Motorola has been one of my favorite mobile phone manufacturers and I have two Motorola phones which are around 3-4 years old and are still working perfectly. Also, the only other Android phone that I know of which has a QWERTY keyboard is the HTC Dream so it's nice that Android fans who are looking for an HTC Dream alternative, will finally get a choice. Milton Keynes to be first place in UK to see the Motorola DEXT™ with MOTOBLUR. The new Orange Multimedia Store in Milton Keynes, which officially opens at 3pm on Tuesday 6 October, 2009, will be the first place in the UK to showcase the much anticipated Motorola DEXT with MOTOBLUR, a day before it's available anywhere else in the UK. Available only on Orange, the DEXT is the first mobile phone with MOTOBLUR technology- allowing you to synch all your communication, from work email to social messaging activity, directly to your home screen in easy to manage streams. Orange will have some expert advisors and trainers in store on opening day to demonstrate the phone's multimedia capabilities to customers. To find out more about the DEXT and to see a video of it in action, click here www.newsroom.orange.co.uk/2009/09/16/motorola-introduces-dext-with-motoblur-your-entire-social-life-in-a-single-stream-available-exclusively-on-orange/> . Orange is offering the DEXT free to customers who take out 24 month contract at £34.26 per month. DEXT will be available at the new Orange Multimedia Store in Milton Keynes from October 6th, and nationwide at your local Orange store from October 7th. Completely agreed. It's about time that motorola introduced a good touch screen phone and I think that the motorola dext could be it.